This is a song written a while back by th UK band Cormack. They have finally got a clip together for it. Please take the time to watch it and post onto every website, friend and wall you can, then ask them to do the same to support these brave soliders that have and continue to defend......... our way of life despite sacrificing there own. Our goal is to have it viewed by over 1 million. Thanks for the support in advance. When Capt. Robert Semrau’s court martial starts next Monday, it will be the first time in the long history of the Canadian army that a soldier on the battlefield, in a war, faces murder charges for killing a wounded enemy. In no way should this imply that it’s the first time this has happened. In every war Canada has fought, things happen on the battlefield that rules and traditions forbid, but which are deemed necessary at the time. Invariably, silence prevails. Semrau’s patrol of mainly Afghan soldiers, for whom he was a mentor and trainer, was ambushed in October 2008 in the volatile Helmand province. Two months later, he was charged with murdering a gravely wounded Taliban fighter. When the ambush was broken, two shots were heard and it was presumed the wounded Taliban insurgent was killed. Later Semrau, 35, was charged with second-degree murder, attempted murder (odd, but one supposes this is in case the murder charges collapse). 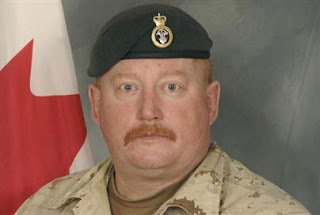 Other charges are “behaving in a disgraceful manner,” and “negligently performing a military duty” — both of which seem absurd, considering Semrau’s exemplary record of three years in the British army (Macedonia and Iraq) before joining the Canadian army in 2005 and serving with the Royal Canadian Regiment in Afghanistan. It would seem Semrau’s choice on the battlefield that Oct. 19 was either to leave the wounded man to the mercies of Afghan soldiers, or to abort the patrol to attend to the mortally wounded man. Aborting the patrol would have meant the ambush had succeeded in deterring the patrol. Semrau opted to continue the mission, which was his prime duty. However the trial in Gatineau, Que., turns out, it is unprecedented and startling. And in my view, should never be taking place. Of course, once an official complaint was made, high command really had no choice. The soldier who “informed” on his officer is another story — and I cannot imagine him staying in the army, where I suspect he’s reviled and despised by fellow soldiers. As one who has been in a war, been on a battlefield, faced a determined enemy, I have some sympathy with Semrau’s situation. As an officer, the responsibility for a quick decision was his alone — and a life-and-death one at that. My battlefield experiences — apart from those encountered in journalism — involved the Korean war. I suspect I may be the only working journalist in Canada today who has been a platoon commander in a war. Looking back, I can see myself and other field commanders reacting as Semrau may have reacted. What I would not expect — and cannot even imagine — is men I served with blowing the whistle if I had to make the sort of decision Semrau faced. I think my reaction is pretty typical of my generation of wartime soldiers. After D-Day, in the Second World War, Canadian soldiers shot German prisoners in retaliation for the SS summarily executing Canadian prisoners. Nothing was said, nothing done. No remorse. No recriminations. Just silence. With no body, no identity, perhaps no credible witnesses, no tangible proof, the case against Semrau may founder. A crime may be difficult to prove. Ironically, former U.S. presidential candidate John Kerry was awarded a Silver Star in Vietnam for killing a wounded enemy who was trying to kill him. If found guilty, Semrau faces prison. Some difference! As a fine officer and excellent soldier, I hope the army doesn’t lose Saskatchewan-born Robert Semrau. KANDAHAR AIRFIELD, Afghanistan -- As a piper mournfully skirled Dark Isle and Going Home, Sgt. John Wayne Faught's flag-draped casket was borne by fellow infantrymen Sunday to an air force transport that will return him to Canada one last time. The sergeant from Sault Ste. Marie, Ont., was the first Canadian soldier to die in Afghanistan in 2010. He was killed Saturday when a landmine exploded underneath him while he led a foot patrol near the village of Nakhoney, about 15 kilometres southwest of Kandahar City. The 44-year-old section commander from Delta Company, 1 Princess Patricia's Canadian Light Infantry of Edmonton was on his sixth foreign tour and his third in Afghanistan. He was the 139th Canadian and the 38th Patricia to die in Afghanistan since Canada first sent troops to Afghanistan in 2002. "He was a leader who led from the front," said Padre Dennis Newhook of Trinity Bay, N.L. Sgt. Faught's troops have lost "an extraordinary friend who died leading and protecting them," he said. Sgt. Faught is survived by his mother, Donna Marie, in Sault Ste. Marie, a sister in Toronto and a girlfriend in Thunder Bay. Maj. Wayne Niven said he would remember Sgt. Faught, who served in his company, always chewing on a plug of tobacco and for his exceptional devotion to his young troops. Before deploying to Afghanistan, Sgt. Faught, who joined the army 23 years ago, had spent a lot of time with each of his soldiers to make sure that their personal affairs were in order. "He was known for his methodical, disciplined approach to soldiering," Niven said. "He was on point [the first man at the front of a patrol] and would never have handed off to one of his soldiers. That's why we're here today." The federal government announced Sunday that 1,000 french speaking troops from Canadian Forces Base Valcartier in Quebec would start heading to Haiti next week as disaster relief from around the globe poured into the Caribbean country following last week's devastating earthquake. Defence Minister Peter MacKay said the troops would take about a week to arrive. "There's a lot of moving parts. We have equipment going in, we have Canadians going out and we will have these soldiers, beginning early next week, flowing into the country," Mr. MacKay said at a news conference in Ottawa on Sunday morning. He described the situation in the capital as "grave and fragile" with stress and anger creating security problems. "There's no doubt the security situation is volatile," he said. "We have Canadian forces that are trained specifically in crowd control." There was evidence of that instability this weekend. Reporters for Global National came across the bodies of two men with their hands bound behind their backs. Their limbs had been hacked at by machetes and they had been shot in the head. People nearby said police had killed the men for being thieves. The earthquake has left prisons in shambles, allowing some inmates to escape, adding to security concerns in the region. More than 1,150 Canadians remain missing in the devastated country, and 1,122 have been located since the 7.0-magnitude quake on Tuesday, Foreign Affairs minister Lawrence Cannon confirmed at the same Ottawa news conference Sunday. Hundreds of Canadians have been flown back to Canada on military aircraft with another plane load arriving on Sunday morning. In total, nearly 600 people have been rescued. A lot of relief money is being raised for Haiti through social media. The campaign, made viral on networking sites like Twitter and Facebook, had raised $8 million by Friday, in the United States according to a Twitter message from the White House that was reposted on the Red Cross account. Here in Canada people with Rogers or FIDO phones can also donate directly through a mobile giving campaign which enable customers to donate funds to help the relief efforts in Haiti in the wake of a 7.2 magnitude earthquake on January 12, 2010, which has left many parts of the country devastated. Rogers Wireless and Fido customers are encouraged to help those in Haiti by donating to Partners In Health: Haiti and other Haitian relief organizations. By sending the text message "HELP" to shortcode 1291. Customers can donate $5.00 CDN to the Haitian relief efforts. Rogers is working with The ONEXONE Foundation to facilitate 100 per cent of donations in funds and goods to Partners In Health: Haiti and other Haitian relief organizations. HELMAND PROVINCE , Afghanistan – Laki, a village in Afghanistan, located in the southern portion of 2nd Battalion, 2nd Marine Regiment's area of operation in the Garmsir District of Helmand province has never had a conventional coalition force visit or even walk down its streets. The Marines and sailors of Weapons Company and Jump Platoon, 2/2, were the first to break this streak as they entered the village and patrolled the streets of Laki Jan. 4-7, 2010, to familiarize themselves with the local populace and to begin providing security in the area. One such patrol began in the mid morning hours of Jan. 5, as Marines and local members of the Afghan National Army set off with the hopes of meeting with the local village elders of Laki. Their first stop on the trip across the muddied roads and fields of Laki was at a local physician's office and pharmacy where Navy Lt. Malcolm Brown, the battalion surgeon, met with the doctor to find out what kind of medical equipment and medicine he needed. The office was a small, white compound located down a road that connected to one of the main roads that went through the village. Surgical equipment sat on a small metal tray next to the front entrance. Off to the side, in a smaller room, the doctor and Brown sat talking to one another about the hospital, what equipment or medicine it may need, and how to get it to Laki. "I think initially he was nervous with us being there," said Brown. "Fear of the unknown from us and the Taliban a little bit." Along with the main doctor, the office also employed a doctor who administered injections and female nurses which allowed them to also care for female patients. Having two doctors and a few nurses enabled them to see around 50 patients a day using the provisions provided by their government. "He seemed well equipped with the exception of not many medications," said Brown. "He seemed pretty satisfied with the process of asking the central government for funding and supplies." After the meeting with the doctor the Marines set off across the fields of alfalfa, through tight alleyways, and one-lane roads, stopping for anyone who would stop working long enough to talk to them. They eventually ended up in an open area, surrounded by compounds, where a group of men sat drinking tea. "We're (International Security Assistant Forces) and we're here to ensure that the Taliban are not destroying anyone's way of life," said Capt. Matthew J. Kutilek, the commanding officer of Weapons Company, as he began a short dialogue with the men. The older men identified themselves as the village elders of Laki and discussed with Kutilek the current security situation in the area and how they could help one another with the searches of the compounds. With respect to their culture, the elders simply asked that the Marines inform them when the searches would be done so that they could call their farmers in from the fields. "We are happy about this," said one local elder. "There was 20 to 30 years of conflict in this area. We are happy you are here." The short conversation brought about positive results as the Marines and elders took the chance to get to know each other. "The elders here are very strong people with good leadership skills who have the respect of the local populace," said Kutilek. The people here do not support the Taliban. They were just under their control. They don't like the Taliban." With the hot afternoon sun overhead, the Marines passed through more alleyways and fields and talked to farmers in the fields and groups of men meeting beside the roads. As they continued their patrol they came across an older man sitting on the road with two of his kids. After speaking to him for a few minutes he informed the Marines of a possible improvised explosive device in the road ahead because of wire he had seen laid and buried across the road. "We've had multiple people tell us about locations of weapons caches, IEDs, and command wire," said Kutilek. "The people here have been very helpful." After a thorough search of the surrounding area the Marines located and gathered up the command wire but were unable to find any roadside bombs. However, it showed that the locals had a willingness to help the Marines despite being in an area where Taliban intimidation was expected. "I believe they see the U.S. as liberators from the oppression of the cowardly foreign Taliban," said Kutilek. "I think most people here desire peace and the Taliban does not offer that; they offer instability." With one more day done, and one more possible IED found the Marines of Weapons Company will continue to establish a relationship with the Laki locals and continue to work to provide security. "I think we're well on our way to providing security for this area because the elders have not allowed the Taliban to have a stronghold, which is a welcome surprise," said Kutilek. What follows is from the December 30, 2009 issue of the Army Times and it is disheartening to read that US Military commanders are defying GEN McChrystal's COIN doctrine. This is very frustrating because COIN is proven to work and if NATO is going to have any chance to win then COIN must be embraced and practiced. This is a long article but I'm posting it in full. GEN McChrystal has praised Canadian troops in Afghanistan for embracing population centric COIN. That he is having problems with his own commanders in the U.S. military is very disturbing to say the least. My old friend and COIN trainer Blue writes here about the dificulties he and his team face in getting the word out. ARGHANDAB RIVER VALLEY, Afghanistan — The view west from the roof of the Arghandab district center at sunset in mid-autumn is breathtaking, the remaining leaves turning the valley into a sea of green and gold. Beneath the branches, the Arghandab’s signature pomegranates lie in rotting piles and the orchards are strewn with booby traps ready to sever a limb or take a life. Gunfire and explosions echo from end to end of the valley’s lush “green zone.” Once known as the breadbasket of Afghanistan, the Arghandab has become a killing field. Battle has been joined in the valley because of its proximity to Kandahar city, a rich prize two miles to the east across a razor-backed ridgeline. Until this summer, insurgent control of the valley was unchallenged. Then 1st Battalion, 17th Infantry Regiment, 5th Stryker Brigade, 2nd Infantry Division, moved in, and the fight was on. The vicious struggle in and around the Arghandab since the battalion’s arrival has killed 21 1-17 soldiers and more than 50 insurgents, led to a popular company commander’s controversial replacement and raised questions about the best role for Stryker units in Afghanistan. It has also caused the soldiers at the tip of the spear that the United States hurled into the Arghandab to accuse their battalion and brigade commanders of not following the guidance of senior coalition commander Gen. Stanley McChrystal to adopt a “population-centric” counterinsurgency approach. And now, reeling from the deaths of their comrades and the removal of their company commander, the troops have been ordered out of the Arghandab, a move they say feels like a defeat. It was July when 1-17 deployed to Afghanistan, and August when the battalion moved into the Arghandab. Within 48 hours, they were in combat with some of the 200 to 300 insurgents in the “green zone” — a 14-mile-by-four-mile patchwork of small fields, orchards and vineyards. The dense foliage and high mud walls offered insurgents ample hiding places for the booby traps the military refers to as improvised explosive devices. The first 1-17 soldier to die was Spc. Troy Tom, killed Aug. 18 by an IED. The casualties mounted steeply thereafter, climaxing Oct. 27 when seven soldiers and an interpreter died when their Stryker was destroyed by the force of an estimated 1,500 pounds of homemade explosive buried in the banks of the Arghandab River. By early December, the battalion had lost 21 men. In late November, brigade commander Col. Harry Tunnell decided a change had to be made. He replaced Capt. Joel Kassulke, the commander of 1-17’s Charlie Company, which had taken 12 of the casualties. But Kassulke’s former soldiers say that not only was he not to blame for the casualties, the 1-17’s problems started much, much earlier. The battalion had spent much of the previous two years training for combat, but preparing for the wrong theater — until February, when it got orders for Afghanistan, 1-17 was scheduled to deploy to Iraq. However, 1-17 soldiers said their training, which had been focused on highly “kinetic” urban warfare drills such as room clearing, did not change much to accommodate the change in mission. “The COIN-intensive fight here … isn’t so much what we trained on,” said 1st Lt. Kevin Turnblom, Charlie Company’s fire support officer. The 1-17’s soldiers said their train-up was also marked by an absence of good intelligence on what they would be facing in the Arghandab. In their zeal to give their men some insight into their future area of operations, noncommissioned officers such as Staff Sgt. Matthew T. Sanders, 1st Squad leader in Charlie Company’s 1st Platoon, resorted to printing out information on the Arghandab region from the Long War Journal, a respected non-Defense Department Web site, and posting it on bulletin boards. “We made our own little S-2 because we weren’t getting anything from the S-2 [intelligence directorate],” Sanders said. When 1-17 got to the Arghandab, the insurgents were lying in wait in the green zone, armed with homemade bombs similar to those that have killed thousands of U.S. troops in Iraq and Afghanistan. This came as a shock to 1-17 commander Lt. Col. Jonathan Neumann, who hadn’t anticipated being drawn into a fight in such constrictive terrain, where the troops learned quickly that they needed to dismount from their Strykers and patrol on foot. The IEDs also came as a huge surprise to Neumann and most of his soldiers, who said they’d been told to expect that the major threat would come from direct fire. This, despite the fact that during the first six months of 2009, as the brigade was training up, more than twice as many U.S. soldiers in Afghanistan died from IED strikes than were killed in gunfights. As the casualties from IEDs began to rise, so did the troops’ anger with what they viewed as their leaders’ failure to prepare them for the threat. RC-South spokesman DeSantis said that 1-17 had conducted “extensive leader training” and “comprehensive” lane training on IEDs before deployment. Once the extent of the threat became clear after arriving in Afghanistan, the brigade pursued innovative training and “intelligence employment” to counter it, he said. As a result, the brigade has not lost a soldier in more than a month, while the percentage of IEDs that are found and cleared rather than struck has improved from 41 percent in August to 63 percent so far in December, he said. In command briefings and interviews, 5/2 Stryker Brigade leaders are keen to give the impression that the unit has fully embraced the tenets of counterinsurgency doctrine. There is much discussion of the governance, reconstruction and development fusion cell headed by Lt. Col. Patrick Gaydon, the brigade special troops battalion commander. “We think that mission is so important that we devoted his battalion staff to be the fusion cell leads,” Tunnell said. “He and his kids have done a superb job,” leading to the creation of a database of village elders, government leaders and similar figures, he said. Soldiers in 1-17 say that while the battalion’s junior leaders have embraced these principles, Neumann and Tunnell — whose brigade’s motto is “Strike — Destroy” — have not. “There’s definitely a disconnect between the platoon and company level and the battalion and brigade level,” said a Charlie Company soldier in a leadership position, who requested he remain anonymous. “McChrystal’s guidance is very clear on its population focus,” said another junior leader. “That has absolutely been the message that’s been delivered from higher,” agreed Turnblom, the Charlie Company fire support officer. When the brigade deployed to Afghanistan, Tunnell announced his intention to pursue a “counter-guerrilla” campaign. Most observers perceived a conflict between Tunnell’s approach and McChrystal’s population-centric counterinsurgency campaign. Brenda Donnell, spokeswoman for the Maneuver Center of Excellence at Fort Benning, Ga., said FM 90-8 had been superseded by FM 3-24.2, Tactics in Counterinsurgency. “It’s not supposed to be used anymore,” she said of the counter-guerrilla manual. Tunnell, who was badly wounded as a battalion commander in Iraq in 2003, was adamant that the situation in the Arghandab lent itself to the counter-guerrilla approach. Tunnell’s counter-guerrilla vision has driven his brigade’s missions, particularly in 1-17’s area of operations. “We definitely haven’t been COIN-focused in the Arghandab, we’ve been counter-guerrilla focused,” Burton said. What has particularly angered soldiers here is the series of brigade-level clearing operations through the Arghandab ordered by Tunnell to cement his troops’ hold over the Arghandab and particularly the green zone, where the bulk of the population live, according to Tunnell. “That’s one of the challenges of a population-centric strategy: you have to go to where the population is,” he said. Sustain Hold was aimed at getting 1-17 deeper into the green zone and establishing platoon-level patrol bases, he said. But while the logic behind the operations is clear to Tunnell, it is less so at the company level. That is the prevalent view in Charlie Company. Frustration has bred a cynical humor at the Joint District Coordination Center where Charlie Company has made its home. A quote posted on the wall of the company’s command post and attributed to the first sergeant, Charles Burrow, reads: “Apparently COIN stands for Clearing Operations in November.” Burrow declined to be interviewed for this story. “He made no dice about the fact that he was openly trying to conduct a more counterinsurgency fight,” Turnblom said, adding that Kassulke was trying to nest population-focused missions inside the enemy-focused operations imposed by Neumann and Tunnell. But soldiers who worked closely with Kassulke said he harbored deep misgivings about the enemy-centric focus of the missions he was ordered to conduct. Those doubts, along with his determination to do what he thought was right, brought him into conflict with his battalion and brigade commanders, his soldiers said. In the context of Charlie Company’s experience, the McChrystal quote seemed right on point. But when Neumann saw the quote during a visit to the JDCC, he told the battalion operations officer to direct Kassulke to take it down. ”I had them take it down to not get ahead of ourselves,” Neumann said in an e-mail to Army Times. Kassulke said the incident was “not even a big deal at all,” but to his soldiers, the fact that their battalion commander was ordering the removal of a quote from McChrystal emphasizing the population-centric approach to counterinsurgency summed up the apparent disconnect between the company-grade leadership and their higher chain of command. A few days later, Tunnell announced that he would be replacing Kassulke early as commander of Charlie Company. The replacement was not a formal relief. Kassulke and the incoming commander, Capt. Max Hanlin, conducted a regular change-of-command ceremony Nov. 24 at 1-17’s headquarters at Forward Operating Base Frontenac, 364 days after Kassulke took command. A standard company command lasts two years. But Tunnell’s removal of the popular and charismatic Kassulke stunned Charlie Company. “The glue that was holding the company together was Captain Kassulke,” said Spc. Nicholas White, a machine gunner in 4th Platoon’s second squad, who was not alone in describing Kassulke as “the backbone” of Charlie Company. None of the Charlie Company soldiers interviewed said Kassulke was at fault for the heavy casualties his unit had suffered. “I certainly don’t think the company-level leadership could have done anything differently” that would have prevented the casualties, Turnblom said. Tunnell said that the casualties suffered by Charlie Company influenced his decision to replace Kassulke “a month or two” earlier than planned. “It was going to happen in the December/January time frame anyway,” he said. Some in Charlie Company thought Tunnell’s replacement of Kassulke so soon after the captain had told the colonel of his concerns over Focus Hold was no coincidence. “It’s probably bad juju for an O-3 to tell an O-6, ‘Hey, you’re not doing what the four-star wants you to do,’ ” said a soldier. But Tunnell denied this through DeSantis, who said Tunnell had visited and spoken with Kassulke at the JDCC prior to Focus Hold as part of a routine process of gathering “input” from subordinate leaders prior to a major operation. “[I]t did not have any bearing on his assignment within the brigade,” DeSantis said. Kassulke, who was moved to a brigade staff position in Zabul province, likewise played down the conversation’s significance. “As far as I am concerned, this was a normal conversation about operations, and ... he was genuinely interested in hearing my opinions as one of the company commanders who would be participating,” he said. Kassulke declined to detail the conversations he had with Tunnell regarding the switch. “The change of command was a surprise to me, but the brigade commander had a plan and this was part of it,” Kassulke said. The impact on the company of Kassulke’s reassignment was exacerbated by Tunnell’s decision to pull the unit back to Frontenac for two weeks, coinciding with the memorial ceremony for two of the company’s soldiers killed in a Nov. 5 IED strike and the change of command. The move to Frontenac kept the company out of the fight “when we needed to get back on the horse,” Hughes said. But the final blow to the company’s morale was still to come: the new RC-South commander British Maj. Gen. Nick Carter chose to pull Charlie Company and the rest of 1-17 out of the Arghandab permanently and replace them with elements of the 82nd Airborne Division’s 4th Brigade. Carter had a new mission for Tunnell’s brigade: ensuring freedom of movement along the major highways in his area of operations. The mission was a vital one for which the Strykers were uniquely suited, the British general said in an interview with Army Times. Restoring security to Afghanistan’s major highways is a necessary and important step in boosting southern Afghanistan’s economy and restoring governance to the region, Carter said. Several junior leaders in the battalion said the change of mission was a reflection of their chain of command’s failure to embrace population-centric counterinsurgency. “Us leaving here, I’m pretty sure that qualifies as a defeat,” he said. Carter disagreed, saying the 1-17 soldiers “created the conditions to hand over the Arghandab in much better condition than it was two months ago, to another unit, thus releasing [the 1-17] to go on to what is a much higher priority task, and a task which is much better suited for [the 1-17’s] capability. “They’ve been pulled out because they are the right capability to go on to what is the most important task in my judgment in Regional Command-South at the moment,” he said. “[T]his task is not simply a task of driving up and down a strip of highway,” Carter said. “In order to secure freedom of movement you have to secure the ground — a tactical bound — to the left and to the right of the highway, and in some places that could be as much as three or four kilometers; in others, it’ll be right up adjacent to it. Neumann said it was important for his soldiers to retain a professional outlook. “The challenge for us is to be emotional about our losses, not emotional about our mission,” Neumann said. Hanlin, the new Charlie Company commander, echoed his boss. “We follow orders,” he said. Kandahar City, Kandahar, Afghanistan (AHN) - The Canadian government on New Year's Day will honor four soldiers and a female journalist who died Wednesday from a blast while their armored vehicle was traveling in Kandahar City. Sgt. George Miok, 28; Sgt. Kirk Taylor, 28; Cpl. Zachery McCormack, 21; and Private. Garrett William Chidley, 21, will be honored in a formal ramp ceremony in Kandahar as their bodies are loaded aboard a transport. Calgary Herald reporter Michelle Lang, who was traveling with the soldiers, also will commemorated. Their bodies are expected to arrive in Canada on Sunday afternoon at the Canadian Forces Base Trenton. Brig. Gen. Daniel Menard of the Canadian Forces said the four soldiers were enthusiastic and passionate. Afghanistan President Hamid Karzai also voiced condolences with the families of the five blast victims. 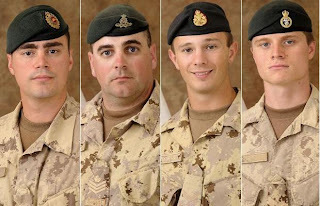 Canadian Prime Minister Stephen Harper said in a statement, "These four brave soldiers lost their lives seeking to help Afghans build a better future for themselves. They represent the best Canada has to offer and they perished in a far away land, working tirelessly to advance Canadian values. We owe them a debt we can never repay." He added, "I also offer my most sincere condolences to the loved ones of journalist Michelle Lang, who courageously risked her life reporting from one of the world's most dangerous countries. She lost her life reporting on the invaluable work being done by Canadian soldiers, aid workers and diplomats in Afghanistan."